The fountain pen was invented by Lewis Waterman in 1884 as a more viable alternative to the traditional dip pens of the time. The pen feeds ink to the nib through a combination of gravity and capillary action. Over the course of the 20th century, fountain pens became very popular because of their ease of use and the beauty with which they wrote. Assume the position. The proper way to hold a fountain pen is to form a triangle with your index finger, middle finger and your thumb. Place the fountain pen in that grip. Make sure the pen is in the proper position. The nib, which is the tip of the pen should be pointed in the upright position. The feed, which is the base of the nib should be down. 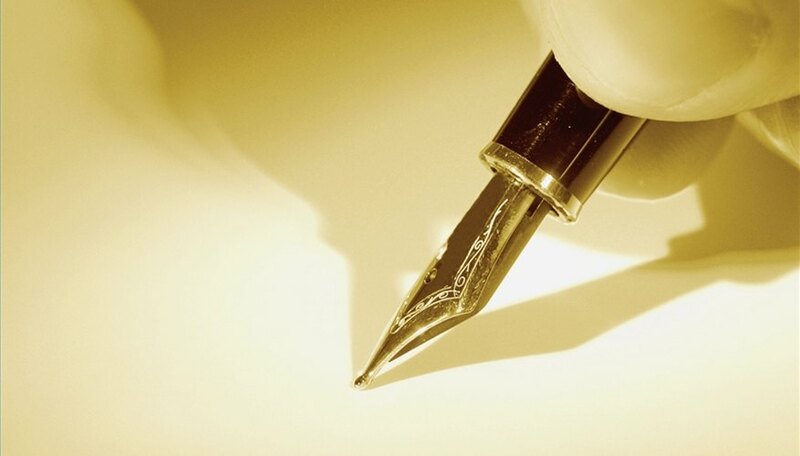 Holding the pen "upside down" so that the tip is in the air, will naturally place the pen in the correct position. Place the cap on the pen. Believe it or not, the balance of the fountain pen is partially dependant on placement of the cap on the back of the pen while you write. The clip of the pen should align with the nib and face out from your grip of the pen. Place pen to paper at a slight angle away from your opposite hand. Do not put any real pressure on the nib, as it needs almost none to work, instead using the ink as a lubricant to glide across the page. If you see the two halves of the nib splaying out, you are pressing way too hard. Write until the ink starts to become thin. If it becomes thick, tip the nib up, wait a moment, and then replace it on the paper. Fountain pens come in a wide variety. Some brands, such as Parker and Lamy use full-sized ink cartridges. These are cartridges that fill the entire barrel of the pen. Most other fountain pen brands including Mont Blanc and Delta, use smaller cartridges called mini-cartridges. Check your brand name to see how to properly refill your pen. Fountain pens typically work less well on thinner or lower grade types of paper. Give the ink sufficient time to dry before touching it to prevent smudging. For left-handers, this may mean ensuring your hand is lifted off the page as you write. If the flow of ink becomes thin and dry, you might be ready for a new ink cartridge. Do not use "India Ink" fountain pen ink is a water based ink. Indian Ink is lacquer based and will seize the pen by clogging it. Don't place the pen in your pocket. While high priced fountain pens should not leak, don't take the chance. Because ink is always wet at the nib (the tip), fountain pens have been known to leak. Make sure it is carried in a case, placed upright in your pocket, or left on your desk.